China’s economic rise and influence has been one of the most significant developments in the global economy of recent times. Last night we celebrated the launch of our new China’s Entrepreneurs Series which takes a close look at the major contribution to this development made by China’s leading private entrepreneurs and companies. The series covers Ren Zhengfei & Huawei, Dong Mingzhu & Gree, Jack Ma & Alibaba, Ma Huateng & Tencent and Wang Jianlin & Dalian Wanda. The event last night which took place at the beautiful St Paul’s Roof Pavilion at the South Bank Centre kicked off with food and drinks, followed by an introduction by Martin Liu, General Manager at LID Publishing, who welcomed Jiang Jun, Vice President of China Publishing House to the stage for a few words. We then got straight to business with our panel discussion. 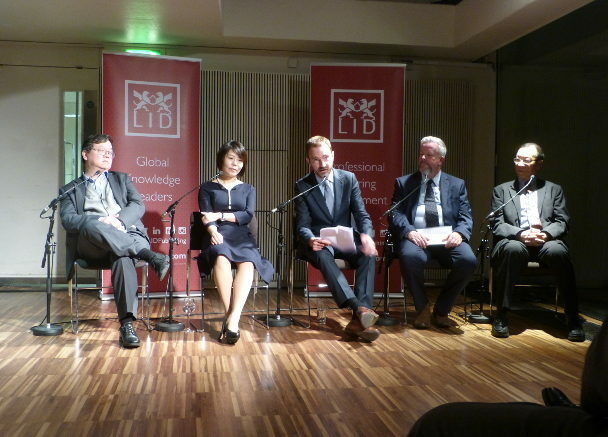 On our panel we had diverse pool of knowledge such as Professor Yi-Ke-Guo, Director of Data Science Institute at Imperial Collage London, Michael Jenkins, Chief Executive at Roffey Park, Dr Jun Li, Senior Lecturer of Management Science & Entrepreneurship at University of Essex, Grace Wang, China Economist at Chinese Business Social Network (CBSN) and Ben Walker, Editor of Dialogue Magazine, who chaired the discussion. Everything from how societal and economic changes (locally and globally) over the past 10 years affected entrepreneurialism in China, the role the background of leading Chinese entrepreneurs play in their willingness to strive for success, to the the key lessons that entrepreneurs from other territories should learn from the experiences of Chinese entrepreneurs and plenty more fruitful view points around the growingly intriguing subject were covered in great detail by our expert panel. The discussion could have continued all night but like all good things the evening had to come to an end! We did however close up on a sweet note with a delicious chocolate pudding and more wine! Be the first to comment on "China’s entrepreneurs launch event"